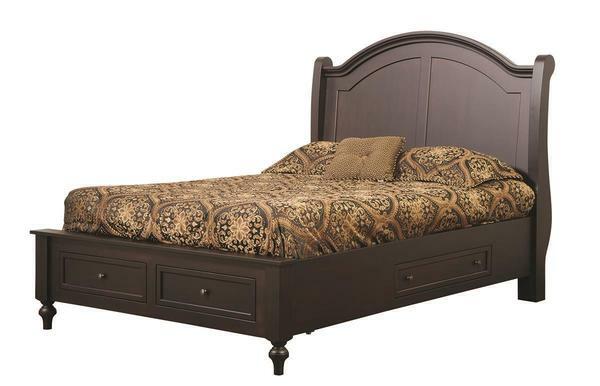 The solid wood Amish Walton Hills Bed with Footboard Drawers and Drop Down Storage offers a mountain of stylish storage for your bedroom display. This inviting design features a curved and rounded headboard to frame the bed with a straight and solid footboard sitting on splendid, shapely feet. Save space in your bedroom with this Amish made storage bed. Customizations offer you options for the Walton Hills Bed. Select the wood and stain of your choosing then decide what hardware you would like for your drawers. We also offer undermount soft close drawer slides ensuring that the footboard drawers will never be slammed shut. This storage bed is a great storage solution for anyone who would like to have their bedroom items more centralized. Take a look at the Amish Walton Hills Armoire to use with this Amish-made bed. Offering the very best in comfort and stability, all of our solid wood beds are built to be strong, durable, and beautiful. Enjoy our blog post, "Refresh the Foot of your Bed with These 7 Ideas" for creative ways to enhance your bedroom furniture display. Please call us with any questions regarding your American home furniture at 866-272-6773. Floor to Bottom of Side Rails Height: 6"
Floor to Top of Side Rails Height: 12"
The new bed just arrived, and I'm happy to say it's gorgeous! So far from what I can tell, it's perfect and correct. I'm attaching a picture of the bed, assembled with mattress and everything! It looks stunning. Very quality and worth the wait. Also, I appreciate the builder accommodating a change in the headboard height. As you can see in the photo, the ceiling comes down so low we can't put anything higher there.